Reflecting on the arrangement of home theater, it is important to pre-design a special room with the necessary attributes. We are talking about sound insulation, planning, wiring and other elements. Suitable for these purposes and a spacious living room, as well as attic and basement floors. The main thing is that the windows should be covered with thick curtains, since any light source is simply unacceptable. Also, such a room should not “contact” with children’s rooms. 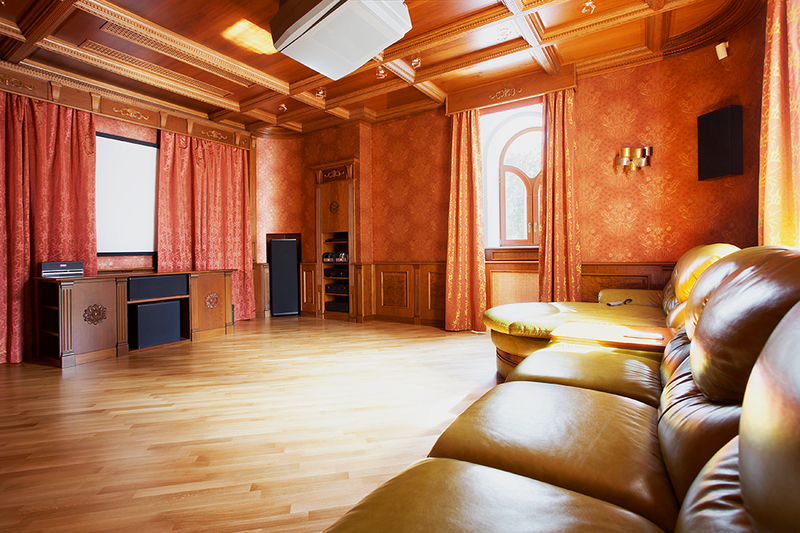 The choice of materials for finishing the floor is an important and even key aspect in the arrangement of home theater. After all, it is the floor that “absorbs” most of the sound being produced. In this case, it is worth refusing from laminate, parquet and tile, giving preference to fleecy carpet. It is important that part of the sound is absorbed by the walls, especially at high power speakers. Ideal – soundproof multilayer panels that do not reflect the sound, gently letting it through. Extinguish vibrations also allow damping pads. As for the ceiling, here it is necessary to give preference to a suspended top of plasterboard. The door must be massive enough, it is not able to miss the sound. The main thing here is to abandon the chandeliers and lamps, as the sound vibration “will force” glass and ceramics to rattle. A great solution – sconces and light panels, endowed with subdued light. It is best to give preference to transforming upholstered furniture. A good option would be seating bags, recliner chairs, which allow you to adjust the angle of inclination. If we talk about the bar, then it should be located behind the viewing area. Home theaters in modern style can successfully complement any interior. At the same time, the wide screen combines well with heavy and solid pieces of furniture. For the design of the cinema hall, the modern style is excellent, where the priority is functionality, clear geometry of lines and light shades. Country lovers will love the brown, light beige and dark chocolate colors that will dominate the room. Arranging home cinema is best left to professionals who will help create an indoor environment that is not only comfortable but also stylish.